Late summer always means one thing: an abundance of everything you grow in the garden… or so I’ve been told. I wouldn’t know firsthand because I can’t grow dirt. I’ve tried many times over the years, but it’s no use. To give you an example: a friend who is also a Florida Master Gardener took pity and offered to help. She came over and planted an assortment of indigenous plants that she said we couldn’t kill. Challenge accepted – they lasted 3 months. Luckily, the farm stands have an abundance as well. Right now, it’s zucchini as far as the eye can see – and I have no problem letting someone else do the gardening. I’ve been making these zucchini cakes for a while and they couldn’t be easier to throw together. In about 15 minutes of prep time, you can be well on your way to a great side dish, salad topper, or meat-free entrée. I’m old-fashioned and use a box grater, but the grating blade of a food processor would speed things up for the technologically inclined (I just don’t like to wash it all). The best secret I can impart is this: drain as much liquid as you can from the grated zucchini. No lie, it is make or break for this recipe. Too much water and the things just fall apart. I usually just wring the dishtowel full of vegetables and squeeze until I’m blue in the face, but you can do whatever works best for you. If time isn’t a factor, you can toss the grated zucchini with the salt, drop it in a colander, weight it down, and let the liquid drain into a bowl for a few hours. Using the dishtowel method turns this into a weeknight dish. Of course, you can change up the flavor ingredients as you desire. I’ve gone the traditional Italian route, but zucchini tend to take on the flavor of whatever you add to them (kind of like mushrooms). And since the 6-year old has decided she likes spicy food, I’ve been allowed to amp up the heat. If that isn’t your thing, then feel free to back off the red pepper flakes (or eliminate it completely). And for fried foods they aren’t too bad, as far as calories go. According to my unofficial calculations, they end up about 100 calories apiece. I’ve been on a healthier kick as of late (ever since I realized I couldn’t button my pants), so this dish has made an appearance on our table whenever I’m really craving fried foods. Let me know what you think – and if you consider yourself a gardening guru, I’m happy to be your greatest challenge. 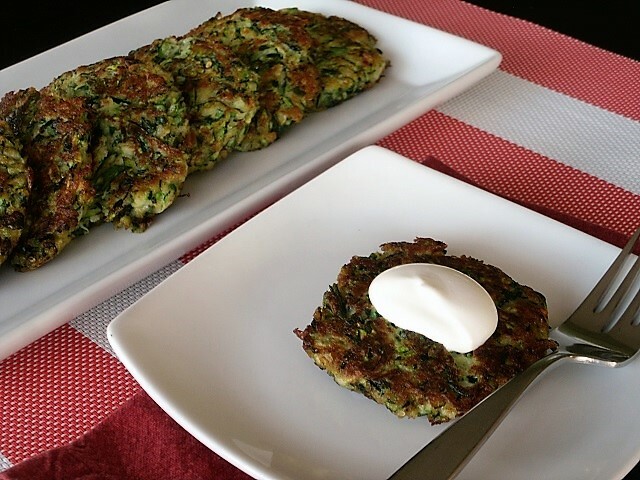 Take advantage of the abundance of the garden with these satisfying zucchini cakes. A great side dish or a light, meat-free entree. Grate zucchini either on a box grater (using the largest holes) or with the grating blade of a food processor. Place grated zucchini in a clean kitchen towel, squeeze out all excess moisture, and discard liquid. Place drained zucchini in a large mixing bowl. Add scallions, garlic, herbs, salt, black pepper, red pepper flakes, and mix to combine. Add eggs, panko bread crumbs, and parmesan cheese. Preheat a 10” nonstick sauté pan over medium heat with 2T of vegetable oil. Working in batches, portion 1/3 C of zucchini mixture into a patty and add to heated sauté pan. Cook until first side is nicely browned, approximately 7-8 minutes. Flip. Continue cooking until second is browned. It should take an additional 5-6 minutes. Remove from pan and place on a baking sheet, lined with paper towel for draining. Add 2 more tablespoons of vegetable oil to sauté pan and cook the remaining zucchini cakes in the same manner. (You can place the finished zucchini cakes into a 200° F oven while you continue cooking additional batches). To serve, to with a dollop of sour cream and additional chopped scallions, if desired. This entry was posted in Cooking and tagged dinner, side dish, vegetable, zucchini. Bookmark the permalink.